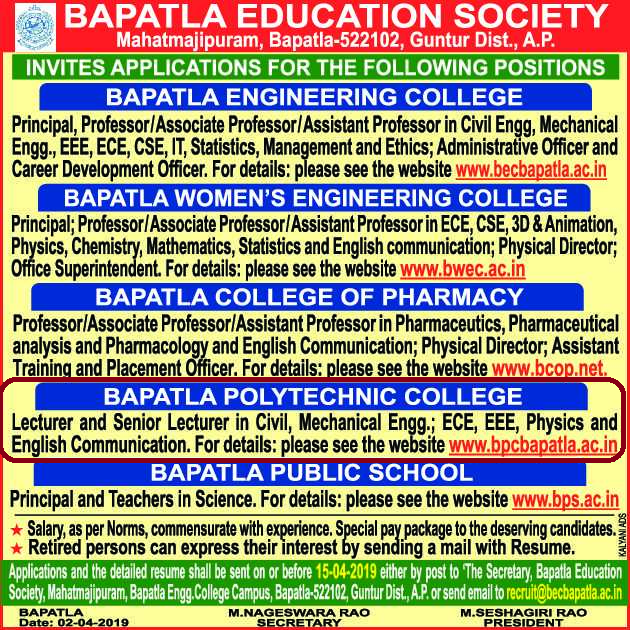 Bapatla Polytechnic College, Guntur has advertised in THE HINDU newspaper for the recruitment of Teaching Faculty- Lecturers / Senior Lecturers jobs vacancies. Interested and eligible job aspirants are requested to apply on or before 06th April 2019 . Check out further more details below. College Profile: The Bapatla Polytechnic College, one of the Six Educational Institutions Sponsored by the Bapatla Education Society, was established in the year 2001 with affiliation to State Board of Technical Education & Training, A.P, Hyderabad and Approved by All India Council for Technical Education New Delhi. B. Tech. in relevant field with at least two years proven teaching experience. Or M. Tech. in relevant field as a full-time candidate with One-year teaching experience. Master’s Degree and M. Phil. in relevant field with first class. One-year experience in teaching communication skills and communication laboratory.